Belated greetings to you Junkies as I post date, yet again, another JSFR. This one is, as many have been this past year, yet another selection from the Great BadGardens JSFR Christmas Gifting. It’s also one of the last of the Great Christmas Giftings so in just a few short posts you wont ever have to read through that again unless there is a Christmas ’08 gifting. In which case, the cycle starts anew. Oddly, this treat is also a hold over from the Great ’06 Gifting from Japan and that particular package just expired this past May. Durable stuff! But what is it? The sister snack (to premier next week or when I get around to tasting and writing it up shortly after I’m through here) lead me and Badmovie (who picked out the goodies) to believe that these were some sort of cotton candy gum like thing. In actuality, not so much and that made us sad. I would love to know how cotton candy gum works. It is cotton candy though and also tartly grape. My word is it grape. Grape-er-ific. It’s so grape that grape popsicles cry in shame. It’s grapier than Bubbalicious Grape. It’s even more grapey than straight up Kool-aid before you add water. If artificial Grape had an Oscars awards, this would take home best actor, actress and both supporting roles no competition. Mind you it tastes nothing like from-the-vine fresh fruity grape but what really does? It also squeaks like compacted cotton candy, which really gives me the glugs. You know how some people have that fingernail-chalkboard thing going on? I’m like that with wadded up cotton candy. Urgle. It’s the consistency of that pink rolled up house insulation too which, if I wanted to be…errr…partial (well, anti-impartial), I’d totally have no problem taking 3 pea points away. But I won’t because it’s just my thing and plus I’d have to add all three pea points back in for the pop rocks. Yeah, that came out of nowhere. Much like the pop rocks did when I was trying these. First it was the squeaky of flatted cotton candy, then that total dissolve-y melty thing that only cotton candy can do (I love that) and then…what’s this? Hard candy bits-POP! CRACKLE! POPPOPPOPPOP! Oh the hee! for that. 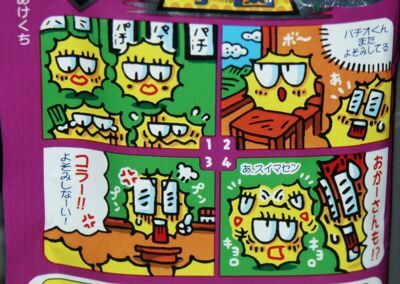 It also explains that look on the character’s face who is crazily hanging out on the packaging. I’d give a word of caution though: Don’t bite off too much cotton candy yumminess because these pop rocks get kinda mean en mass. I nommed off about half the chunk and was experiencing some sharp and extremely enthusiastic pop rocking. This one is from the older expired package. This one from the new packages. Are they sequential? No idea! For the cotton candy, despite it being all squooshed, I’d give these a solid 3.5 pea rating. Meiji did indeed nail the industry standard for Grape as perceived through the use of modern chemicals so plus pea points for that. And extra happy WHEEE pea points for the pop rocks. Heh. POP! The pop rocks really make this snack and if you are 12 years old and reading this, you would totally give these a 5 pea rating. Older Junkies might be a little more reserved and knock half a pea point off on account of cotton candy not being nearly as awesome as Cratz or Winter Pocky et. al. However, many older junkies have misplaced their fun and this is one fun snack. Darn it all, I’m feeling 12 years old today. 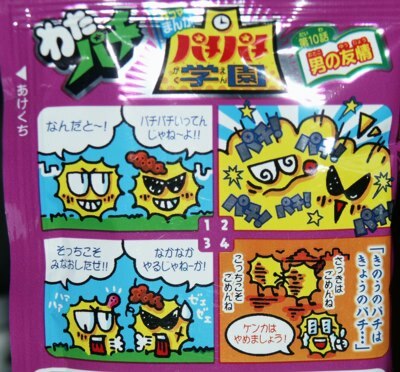 Welcome, pop rock grape cotton candy fun, to the ranks of 5 wasabi peas (out of a possible 5 wasabi peas) snacks. As a contribution to *ahem* science, I want to send you some JSF to sample. If you are interested, let me know please! Sure, what the hey. Drop me a line e-mail-y like and we’ll discuss…science! Hey, I a non-Japanese speaking/reading foreigner living in Japan and go to these little 7-11 type corner stores just for the candy. I have no idea what I’m getting each time,I just buy some stuff and try it out when I’m feeling adventurous. On the bad side, it really stinks – and i mean stinks – when I think I have a sweet snack and end up finding dries squid in my package. 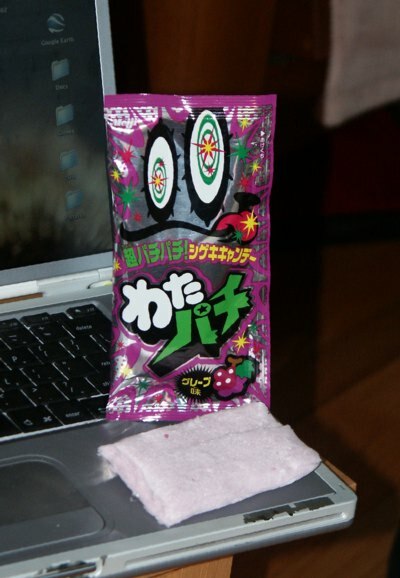 On the good side, finding Wata Pachi (the cotton candy pop rocks treat) was a great surprise. I totally agree with your grapier-than-grape assessment. And popping the whole thing in one’s mouth at once is risky considering these aren’t pop “rocks” they are pop “meteors”!